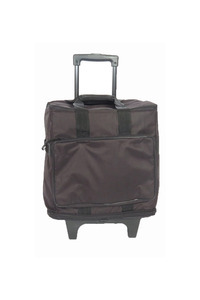 This collapsible bag features 2 ball bearing wheels at the rear of the bag and a 3 stage locking handle. Will fit most small to medium sized sergers with the exception of the Viking s21 and s25. Velcro strap inside the bag to secure serge; 1 pocket inside/1 pocket outside for storage. A security strap and large interior and expanded exterior pockets for notions and patterns. Will fit most small to medium sized sergers, with the exception of the Viking s21 and s25. I'm very happy I found your company I will use you again and recommend you to others. Thank you. I felt the quality of this serger roller bag was far less than the quality of the standard sewing machine roller bag I purchased a couple of years ago. Other than that I'm completely satisfied. This is my third purchase through allbrands.com so you must be doing something right! Enjoy the day. All I can say is wow! The beautiful case arrived this morning which blew me away! The quality is great...my machine fits...and the service was excellent! I will use and recommend your company!